I’ve been talking since I was born. My mom jokes that even before I could speak proper English, I would talk my baby brother to sleep in his crib next to me. When I write, I write as if I am talking. Therefore, I consider myself a natural-born writer. I write every day. I have to write. It’s a part of who I am. During my childhood, I wrote to express myself. Once my stepfather began reading my diary, I began to write poetry to code my feelings and the things that were happening. My favorite part of my childhood was going to school, reading, singing, and writing. Shakespeare was my god. I also loved Greek mythology and humanities. Maybe one day I will be able to write something encompassing all of these matters? After graduating high school, I went to Spelman College and entered as an English major. I didn’t enjoy studying the subject in college and hated that I was subject to my professors’ whims. Although I did well, I didn’t like having to write what they wanted to hear and read. When I transferred to DePaul University, my advisor suggested I major in Marketing. I loved it and still do! I’ve worked mainly for entertainment, fashion, and sports companies. I also ran my own consulting firm for a little while. During the economic change, I decided to attend law school. I did well, but I felt like my creativity was at risk. I did more painting than writing because all of my writing was legal stuff. So I left school and became a songwriter. Songwriting led me to Los Angeles. Not surprisingly, expressing my feelings in song sparked the urge to be closer to my family. But, I didn’t expect to fall in love, get married, and move to Las Vegas. Ironically bored in Las Vegas, I decided to see what I had been writing over the years and The Bizarre Baby Name Book was the first piece I wasn’t afraid to let the world hear me talk about. I am a free spirit. Over my entire life, I pretty much rejected most structured and organized situations. As a child, my math teachers were often frustrated with my process of doing equations. Likewise, my writing process is free and spontaneous. I write a bit of something every day. This may be more of a practice done by songwriters. But, I was able to complete the first three of my books to be published this way. I find that writing every day, passively eliminates stress and pressure of trying to make sense, relate and fit in, or to complete an entire story. Instead, I complete small thoughts each day. I have an abundance of ideas, notes, and/or future books in my phone’s notes. There’s so much I’ve crashed a couple of phones over the years. Ideas also come to me in my sleep. So I keep my computer in the bed or next to me on my nightstand. I love the things that come to me in my sleep. They are much more elaborate and creative. I enjoy them the most. Perhaps my thoughts while I’m awake are mainly rants?! This is my first published book. I submitted my book to Tate and a couple of other small publishing houses on a whim. Tate called within an hour of my submission and the rest is history. I had no idea what I was getting into. At the time, I was a bored housewife, looking for a way to occupy myself. After I signed the contract with Tate, I began educating myself on the process of the book industry and started to prepare for the journey. Although, a publishing house released my book, I am very hands-on. I want to learn everything there is to know about making my book a success. I actually treat my book as if I’ve self-published. It’s also my intention to publish more books, so I’m assuming the more I learn from this experience the better for future releases. K. Alex Shaw was born on August 7 in Iowa City, IA. The self-proclaimed "natural-born writer" considers Chicago her hometown and is the eldest of nine children. She obtained her Marketing degree from DePaul University and has worked primarily in the Fashion, Entertainment, and Sports industry. Currently, she freelances and writes songs. Following her mother's advice, she decided to follow her passion: writing. 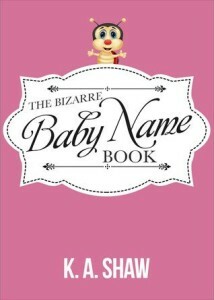 She published her first work, "The Bizarre Baby Name Book" on July 7, 2015.